Me in front of my Nana’s house in PA circa 1978 rockin’ out the Wonder Woman suit! 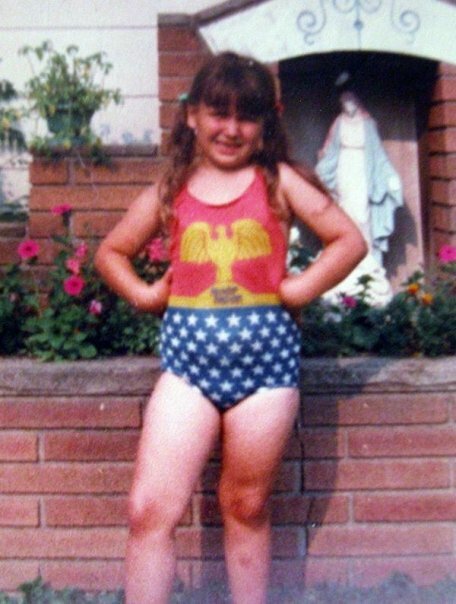 I may not have been a princess when I was a child, but I totally rocked out my Wonder Woman swimsuit all summer long in 1978. I’m pretty sure I had at least three of them. I was constantly wearing my awesome suit; I even wore it under my clothes. I was, in my own little mind, going to be Wonder Woman someday. I felt invincible when I had my Wonder Woman suit on; not even the Mom-ster could bring me down. I loved watching Lynda Carter as Wonder Woman on TV. I also collected and avidly read the comic books, securing my spot in geekdom at a young age. Batman, however, was my very first superhero love; the caped crusader holds that special place in my heart to this day. 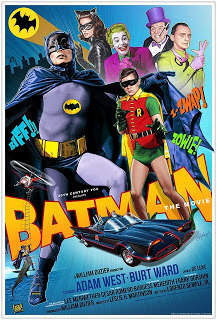 To say I was obsessed with the campy TV show Batman from the 60′s, starring Adam West and Burt Ward as the Dynamic Duo, was an understatement. I would gather up all my Batman toys and Batmobiles in front of the TV and watch the re-runs, completely mesmerized; it was one of my most vivid and happy memories as a child. I still adore watching the show, and get excited when I hear the theme song play. 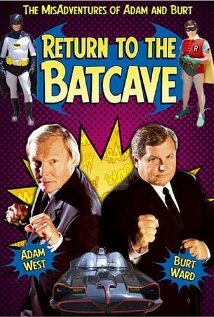 Adam West is still my most favorite Batman ever. As a child, I always envisioned Batman coming to rescue me from my life and making me his new Batgirl. 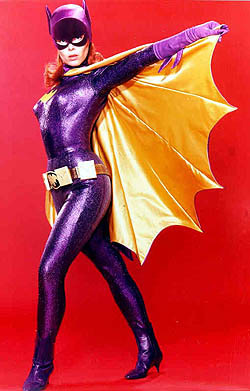 Mom-ster would have been an excellent villain for Batman to defeat – I used to fantasize about that, too. When I was around 5 years old, my brother and sister took me to a matinée showing of Batman The Movie one Saturday afternoon at one of the local twin cinema theaters in town. Unfortunately we didn’t make it to the end of the movie, as we had to leave due to me yelling at the screen, “No Batman! Don’t do it! The shark is gonna get you!” Needless to say my siblings were not happy with me that day. My very best Bat-memory was in the winter of 1976, when my dad took the family (minus Mom-ster) to the Autorama car show in Cleveland; they were featuring the Dynamic Duo as their special guests. I was actually going to meet Adam and Burt in person! I was so excited! Even though I was (almost) four years old, I remember it all so vividly. The real Batmobile was there at the show as well, with Adam and Burt; they even let me sit in it. Adam and Burt gave me a personalized autographed picture from them. 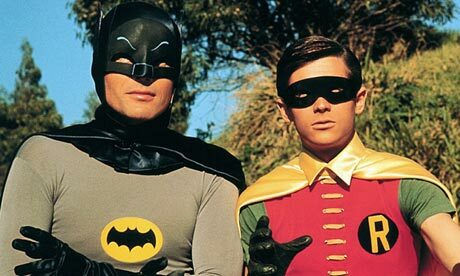 The photo was an 8×10 black and white glossy of Batman and Robin climbing up the side of a building. Adam had written: “To Laurie, our best Bat-fan ever!” then he and Burt signed their names to complete the photo. Later that day after we returned home, my dad put the photo into a plastic sleeve to protect and keep it; I cherished and looked at that photo almost daily as a child. Due Mom-ster’s hoarding issues, the photo got lost in the shuffle by the time I reached my teens. About 18 years ago, Mom-ster decided to sell all of our childhood toys off without telling me or my siblings; these items included my many Batmobiles, Batman colorforms, action figures and finally – my autographed photo. Why they would sell a personalized autographed photo is beyond my comprehension; I was very upset when I found out they sold it. Over the years I’ve found and purchased replacement Batman photos, toys and Batmobiles on eBay and from garage sales and flea markets, but it’s just not the same. I will never get that personalized autographed picture of Adam and Burt back and that really saddens me. What I would give to have that autographed photo back in my possession. The one major highlight of my childhood and Mom-ster had to ruin it. Will our heroine defeat the evil Mom-ster or will she be taken down and destroyed by her evil head games? Stay tuned kiddies – Same Bat-time, Same Bat-channel! I hate the Mom-ster even more now. I too grew up on Wonder Woman and Batman, both in comics and TV, and still love both characters. Thank you for sharing this. I still love Wonder Woman!